Do you know what's a terrible thing to have? Come on, even my 16 year old nephew knows the answer: It's cancer. Yup, cancer is a terrible thing to have, but it's even worse for someone so young. Emily Wrenn, a friend of mine, a woman with an amazing attitude and incredibly positive outlook, has stage 4 lung cancer and cannot receive the treatment she needs through her insurance company. Sadly, we don't live in a society where health care is a human right, so sometimes we must find creative ways to finance the care we deserve and desperately need. That's where we come in: you and me. Emily's fundraising group, https://www.facebook.com/groups/MakingAChangeForEm/permalink/524098717638078/ is working hard to raise funds for Emily's treatments, but they need our help. Every little bit counts, you know? For my part I've decided to design, craft, and donate a very special canteen, the value of which is beyond $700 already. Please note: This is not written for beginners, as the level of difficulty is a bit beyond what a beginner should attempt to tackle. This is the first post of a series, and in these posts I will give you all the information you need, step by step, to create your own canteen, all you need is the proper tools, materials, time and patience. The cause is a great one, in my mostly not-so-humble opinion, and I hope you enjoy this series and are inspired to make a donation - even a dollar helps. Once the canteen is finished it will either be put up for auction, or raffled off. I hope they decide to raffle it off, as more people will get a chance to own it, and she'll hopefully get more money. ALL proceeds from the auction/raffle will go to Making a Change For Em, and will go to her fundraising team directly. I have nothing to do with the money, so if you'd like to donate please click the link above. The woods I chose for the Emily Canteen are, Curly Maple; Spalted Maple; and Walnut. 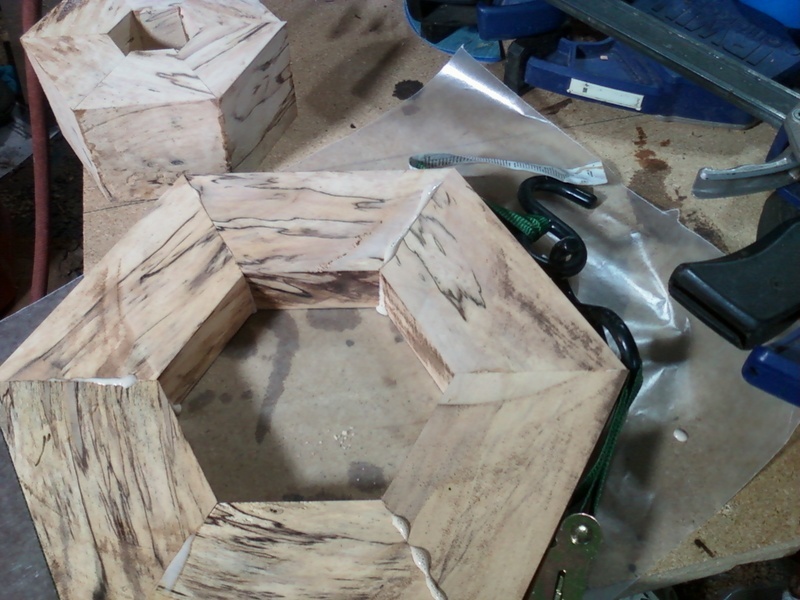 Spalted Maple (Fig. 2) is the only wood chosen that is somewhat difficult to work, as it's not incredibly stable on its own. 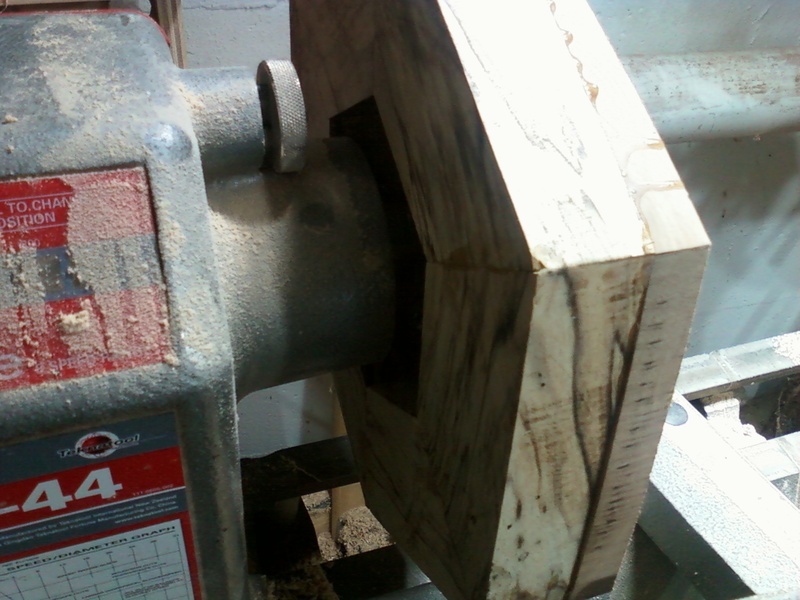 This brand of maple has hard and soft spots, which makes turning it on a lathe tricky, especially the sanding part. You'll find that it tends to develop dips and strains to bring itself out of round. For me that's one of the things that makes spalted maple so beautiful and fun to work with. You can add a wood hardener to assist in stabilization or soak in CA glue, but for this canteen I opted to leave it in it's natural state, imperfections and all. In Fig. 2 you can see both parts of the body, the small inner "doughnut" above, and the larger outer "doughnut." These pieces were cut from a 3 inch thick slab, but I put the larger pieces through the table saw prior to glue up. The outer ring is approximately 1.75 inches thick, which is the thickness I will cut the inner ring down to using the band saw. Now would be a great time to calibrate your miter saw - make all necessary adjustments. Make sure when your saw is set to "0" the blade is 90 degrees to the fence AND the table, then make sure your degree markers are adjusted to reflect proper alignment. As you can see, there are 6 pieces for each ring, which means you need to set your miter saw to 30 degrees for each side of the 6 pieces. In order to get a great fit and for each of the pieces to be exactly the same length prior to glue up, be sure to use a stop block on your miter saw table. Once the pieces are cut, do a dry fit to ensure your angles were sufficient to get a tight fit. If you find your fit is loose make the proper adjustments to your saw and re-cut each piece - this means you'll probably have a final product that is ever so slightly smaller in diameter than you had originally anticipated. One way to prevent this from happening is to cut each piece slightly larger than necessary before the dry fit, then all you have to do is cut them down to size if your angle is correct to begin with. If all fits and there are no gaps you're ready to glue them together. Don't scrimp on glue, but don't over-glue, either. I usually apply glue directly to the piece, then mash the two together and wiggle them a little bit to ensure an excellent fit without excess glue staying in the joint. Titebond III is perfect for a canteen due to the fact that it is waterproof and very tough. The wood will break before the glue lets go of the joint, at least in a properly fitted joint. Next, use a strap clamp to tighten the joint, tightening it as hard as you can without breaking the strap. Put the clamped body on a flat surface and use a mallet to make sure one side is as flat as possible, then allow to dry for at least 6 hours, preferably 24 hours. Repeat these steps for the center ring, if you plan to use a center ring - we'll get to that choice later. While your body is gluing and setting (your CANTEEN body, that is - if your actual body is glued and setting, please go take a shower before continuing), you can prepare your faces - these will make the front and back of the canteen. I chose curly maple for these, because it's so beautiful and the wavy grain reminded me of Emily's wavy blonde hair. 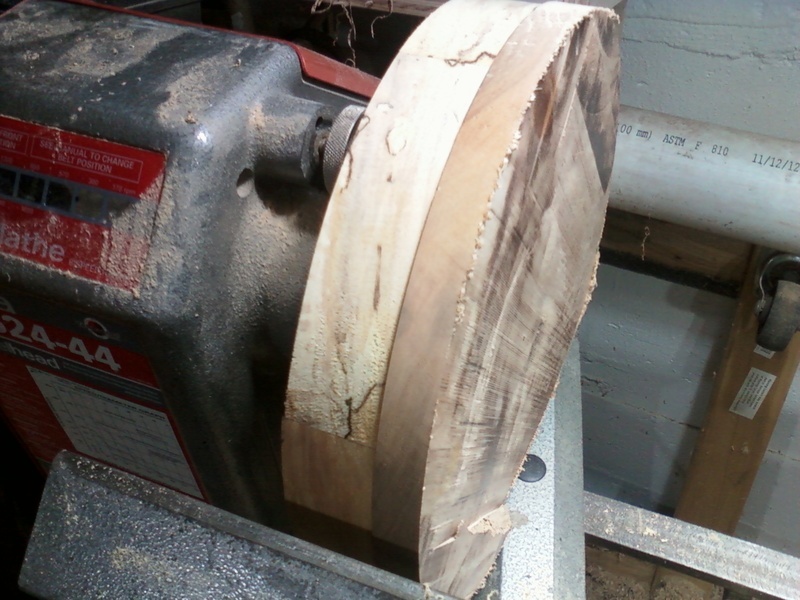 The curly maple in our shop is thick, about 1.5 inches, so I opted to resaw it in half on the band saw and to use the two halves on either side of the canteen. Make sure both boards have at least one flat side, as you'll be gluing your rings to these when they're ready. If you didn't plane your board prior to cutting, you can do so now. Putting both pieces through the planer or drum sander is the best way to ensure a great gluing surface and a fantastic bond, but if you're using curly maple, be sure to take very small amounts off at a time when using a planer, because this wood will tear out easily. Once your outer ring is dry, apply glue to the side that will meet the face, center it on the face wood, and clamp. Wait at least 6 hours, but preferably 24. Before mounting this piece on the lathe, cut off the excess wood from the square face using the band saw, or your saw of choice (see Fig. 3). Note the placement of the SMALL faceplate (on the INSIDE) of the canteen: this is because you'll need to finish the front face before anything else. 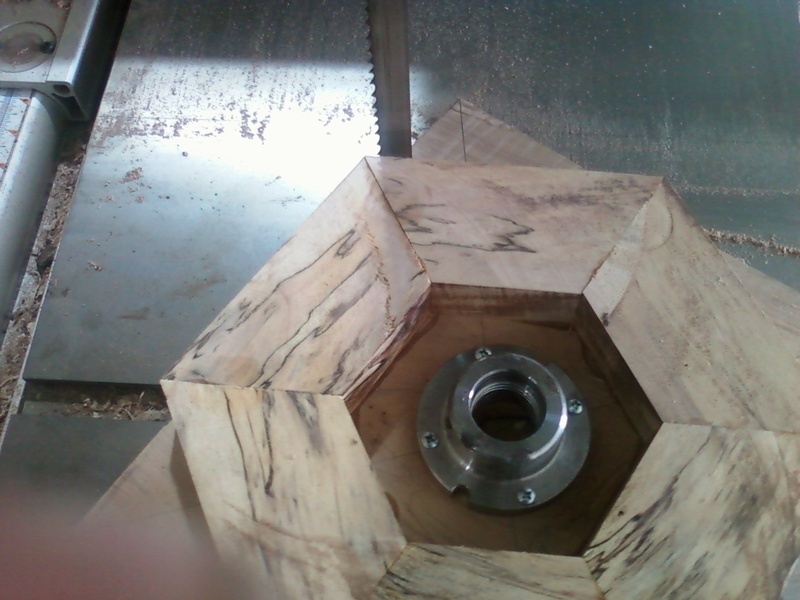 So, once your excess wood is removed on the saw, go ahead and mount it on the lathe (see Fig. 4). Turn to shape, being careful not to cut down to the screws you used to mount the canteen to your faceplate. I will post Part 2 of the Emily Wrenn Fiber Optic Canteen in a few days. Part 2 will show the finished face and body, as well as fitting the fiber optics and sealing. 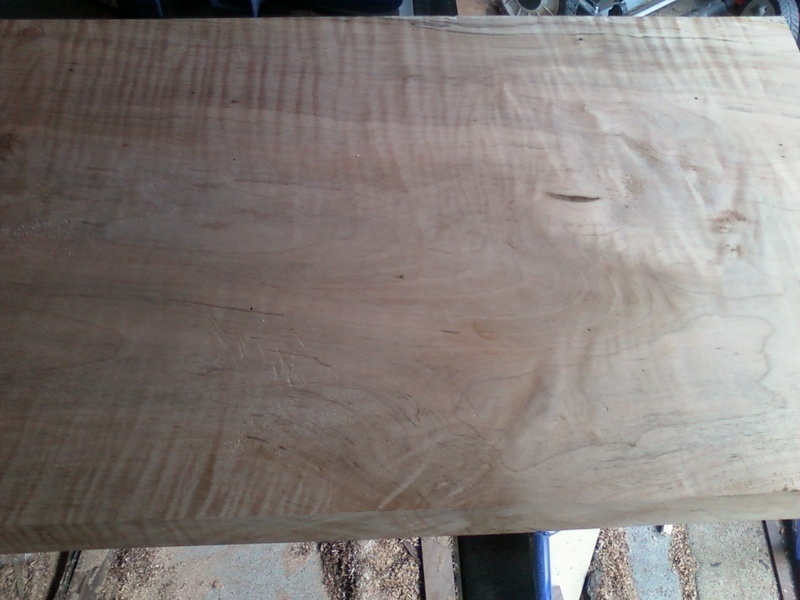 We will carve out a tree pattern and start a stone inlay for some of the fibers to shine through. See ya soon.